Continuing the series of Boeing triple seven models, this time I made a Boeing 777-200 template from Malaysian government-owned airline, Malaysia Airlines. This model is also a tribute to the victims of the plane that is still the mysterious its whereabouts. Not as I suppose, after often read the news about the MH370 flight, none of the Mh370 number printed on the airframe. Not much news agency were stating the aircraft registration number, 9M-MRO, but often informed simply by the flight number, MH370. B777-200 was the initial version before the 300 series that I have the previously release. 200 series fuselage is more than 10 meters shorter and without the swept wing tip as the 300 series. 200 series is 63.7 meters and series 300 is 73.9 cm. I cut the 300 fuselage, before the wing and after the wing. This model also with different engines, it used Rolls Royce engine. While in the previous release 300 series use General Electric engine. Recently, the most bizarre incident happened in the aviation world . 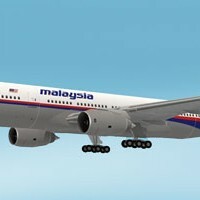 Malaysia Airlines Boeing 777-200 plane disappeared on a flight from Kuala Lumpur to Beijing . It's been almost a month has not been any signs of debris from the flight of MH370 . 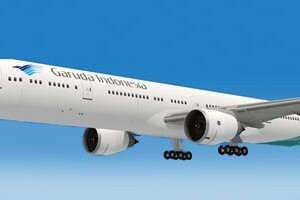 The Boeing 777 is a great aircraft , some of the visitors of Paper replika request for a model replica . Ok, I think I will make but with different color first , as a base . Somewhat different from the MH370 flight using a Boeing 777-200 , PK - GIA from Garuda Boeing is using 777 - 300ER. Newer type and longer . As in the previous airliners models models , this model using the technique with inner glue tabs , but with a little adjustment for easier on assembling . The improvements are removal of the inner glue tabs on the bottom of each part , replaced by moving the flap directly on parts. Inner glue tab is only used to connect between the parts to other parts . Wing attachment has also been strengthened by the use of reinforcing ribs so hopefully the main wing will no longer bent downward. The template consist of 8 pages of patterns. First I would like to condole our friends who become victims of Typhoon Haiyan in the Philippines. It is very sad to see the number of victims and almost half were children. Hope for the best for them and the family. This model was submitted by our friend Miguel Quilab from Philippines. He changed the pattern of Paper Replika's Airbus A330-200 to become A330-343X by adding fuselage length a bit longer than the original. 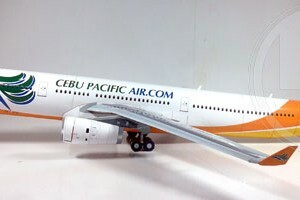 Miguel uses Philippines Cebu Pacific Air livery, its color is beautiful. He also made landing gears patterns and provide a template in 1:100 scale. 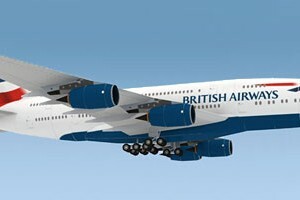 Back to Airliner series, this time the model is Airbus A380 with British Airways livery. The template scale is 1:144 which consist of 15 pages of patterns of the model's skin and formers. I edited the template from an existing Lufthansa A380 template, because it has belly stripe which very similar to British Airways livery. Until now this Airbus A380 is the only and the first A380 operated by British Airways, the other 11 are still in production. This template was submitted by Ing. Jaromír Šmíd from Czech Republic. He send me several templates, all are airlines plane in different types and this is one of them which I pick to be released. 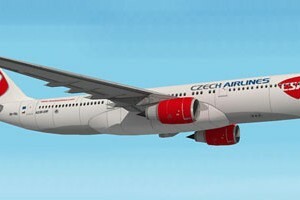 This one is Airbus A330-300 with livery from CSA Czech Airlines (ČSA České aerolinie). CSA was founded on 6 October 1923 as a state owned company. From the beginning CSA used many of Soviet's plane such as Ilyushin Il-12, Tupolev Tu-104A. In the 90s CSA started to use Airbus family planes. The one and only Airbus A330-300 entered CSA fleet in late 2012.